KOLKATA: Usain Bolt's foray into 400m will not happen soon, at least not this year. The 100m and 200m world record holder's agent Ricky Simms that the Jamaican sprinter will stick to only the two sprints at the major events this year . Meanwhile, Bolt's participation in the Commonwealth Games in New Delhi, later this year, remains a matter of speculation. Simms denied quotes attributed to him that the champion sprinter is unlikely to compete in the Games. "The situation remains that Usain and his coach will make a decision about the Games in June or July this year," Simms said. The Delhi CWG will be held in October, at the fag end of a busy season, which might force many athletes to stay away. But the Indian Olympic Association is leaving no stone unturned to persuade Bolt to compete in the second-largest multi-discipline Games (in regards to the number of participating nations). 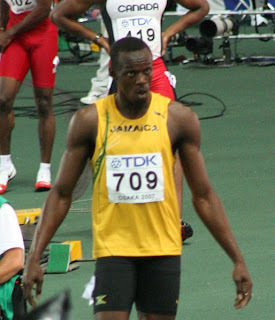 Bolt had expressed a wish to compete at the international level in the 400m, an event he considers among his favourites, leading to wide speculation that he would add the quarter-mile to his profile this year. A number of experts, while analysing Bolt's running style, feel that he would be well suited to 400m, a very technical race. Even Michael Johnson, the former 200m and current 400m world-record holder, thinks that it would be logical for Bolt to move to the quarter-mile.